Life has been a little crazy for the Bugle staff over the last three months. As you may have pieced together from previous posts and photo sets, a colleague from the US was in Luxembourg for the better part of April, thanks to the ash cloud. After three great weekends of company, we were alone again. But not for long! We had one weekend to “turn” the guest room for Sharon and Jaime, our friends who were making a second trip to see us. In order to make the most of their visit, we decided on a three phase approach: I would pick them up in Frankfurt on Friday and the three ladies would enjoy a Germany weekend. We would return to Luxembourg on Sunday night and I would return to work on Monday, allowing three days of Luxembourg sight-seeing with Will. Since most of Europe had a holiday on the Thursday of their visit, I would faire le pont, which meant we could go to Bruges, Belgium. In their 10 day visit, we packed in five countries and a lot of sight-seeing. My hope is to get caught up on photos from their visit — and our Greek Island adventure — before the 4th of July (which means we will clear the backlog by Labor Day). Wish us luck! 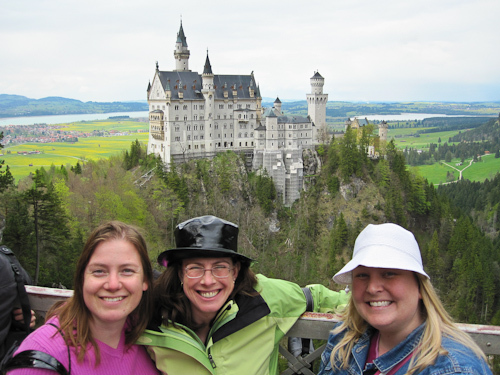 Today, I will tell you about the first part of our Germany adventure: Munich and the castles. After a short delay, both Sharon and Jaime had arrived and we were able to escape the airport. The drive from Frankfurt to Munich is about four hours, which was enough time for some short naps for the travelers. Since we were in Munich for a brief time, we did exactly what you must do when you only have one night in Munich: you drink! 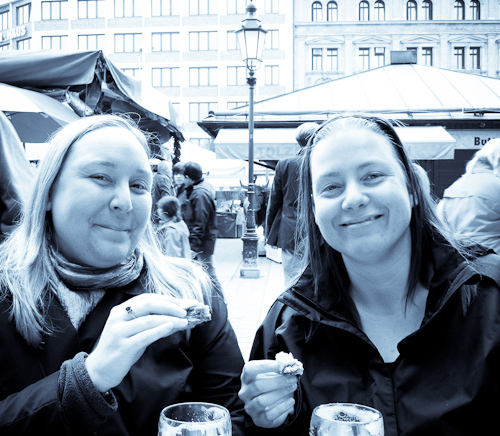 We started our adventure at the Viktualienmarkt. We wandered a bit, taking pictures of the Maypole before settling in for a snack and a beer. Next up was the Hofbräuhaus, a required stop for all tourists in Munich. 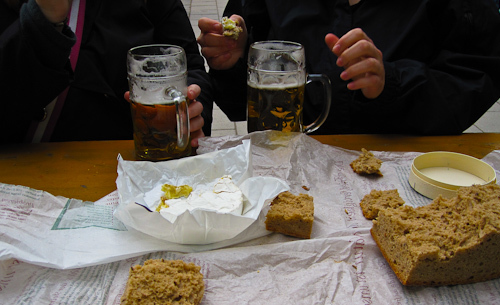 We enjoyed the Bavarian meats and spätzle, plus the great beers. After dinner, the lack of sleep (or the amount of beer) was beginning to get to both travelers, so we called it a night. 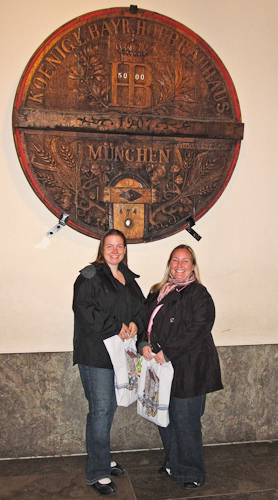 While we barely saw Munich, we enjoyed our time tremendously. Beer count: 0.5L for Sharon and 1L for Jaime. Munich beer total: 1L for Sharon and 1.5L for Jaime. Well done! Saturday morning found all of us well-rested and bright-eyed. 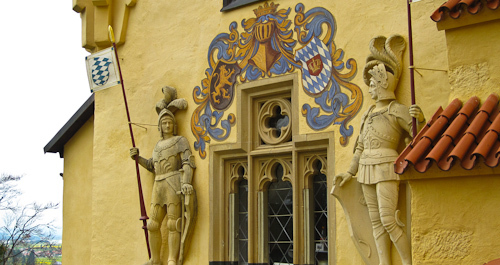 Our plan for the day: drive to the village of Hohenschwangau and attempt to visit both Hohenschwangau Castle and Newschwanstein Castle, time permitting. We found Hohenschwangau without trouble. 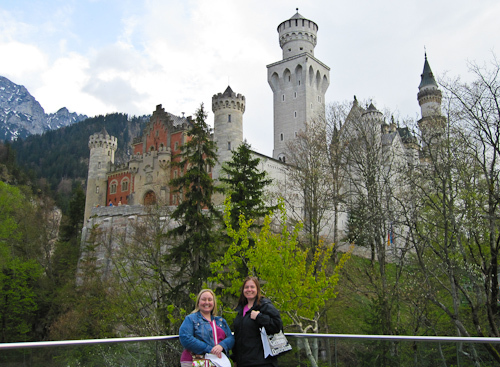 After a quick check of the time, we purchased tickets for both castles, with a visit first to the older, smaller castle of Hohenschwangau and then to the newer and larger Newschwanstein. We even had enough time for some photos between the two castles. After our afternoon of castles, we had just enough time to “dip our toe” into Austria before turning north to our end of day destination: Baden-Baden. We were on a schedule, as we had to check into our hotel by 9pm. What we didn’t realize is that the GPS assumed we would drive the normal speed of 120-130 kpm. I’ve found I am comfortable on German roads at a much greater speed…. and we burned a full 30 minutes off our travel time over the original estimate. I’ll take your guesses in the comments at my average and maximum speeds during our time in Germany…..
For more photos, take a look at the photoset! Coming soon: Baden-Baden and tantrums! What an excellent summary, Anita! It’s a month to the day since we returned home from our wonderful northern European adventure housed and guided by the intrepid and gracious BBB&B staff. Can’t wait to read more and relive all our adventures! very nice!! I like the black & white photo. It looks like we were in the old world. Nothing new about it except for the digital crispness. Any strong feelings about the Germans given their history, or aren’t your prejudices piqued unless Mel Gibson has given a helping hand?